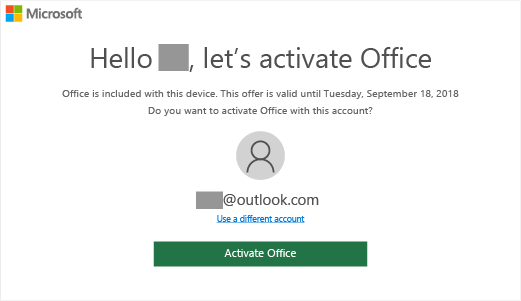 When you start Office on your new Windows 10 PC and see the message Hello, let's activate Office, you can redeem your purchase or offer and activate Office without a product key. If received an offer for Office 365, be sure to redeem it as soon possible. The offer will expire 180 days after you activate Windows. Note: If you see a different activation screen, see Activate Office. Activate Office Check Windows activation Need help? Step 1: Make sure Windows is activated. Step 2: Start an Office app, like Word. Step 3: Select Activate Office. Step 4: Follow the prompts to complete the activation. When your Office purchase or offer is included with your new PC, an Office product key is transmitted digitally to your PC when you activate Windows. You don't need or receive a printed product key. To reinstall Office or manage your Office 365 subscription, you'll use your Microsoft account to log in to your Microsoft account, Services & subscriptions page. Your Microsoft account takes the place of a product key and makes it easier to reinstall and reactivate Office in the future. You must have a Microsoft account to redeem your Office purchase or offer. If you already have a Microsoft account, we can help if you can't remember your Microsoft account or password. In the lower-left corner of your screen, select the Start button, then select Settings . Select Update & Security, and then select Activation. This page indicates whether Windows is activated. If you have trouble activating Office on your new PC, see the sections below for help. This error can occur if you try to activate Office before Windows has activated. To fix this issue, see Error 0xC004F200 when you activate pre-installed Office on a new PC. To find and start a pre-installed Office app, press the Start button on the lower-left corner of your screen and either scroll down until you find an Office application, such as Word or Excel, or type the application name and then select its icon to open it. For more detailed help, see Can't find Office applications in Windows 10, Windows 8, or Windows 7? Make sure you looked for Office apps like Word, Excel or PowerPoint, because there is a separate issue about finding Outlook, Access, or Publisher apps on a new PC that included Office. If you bought your new PC from Dell in China or India, and you’ve confirmed that Office should be pre-installed, follow the steps in this article. If none of the above apply to you, contact the retailer or your PC manufacturer for help. For help with reactivating Office after a push-button reset or on a replacement PC, see Outlook, Access, and Publisher are missing after a push-button reset. After activation, if you're returned repeatedly to the Let's get started page, see Cannot start Office apps after Office activation. This can happen if you uninstall the pre-installed Office and install a Volume License version of Office. To fix this issue, see Office repeatedly prompts you to activate on a new PC. If this happens, close the Office application and restart it. This is a temporary issue.